We’re proud to be included in ShearCraft‘s cruelty free hair guide! Imagine if you could prevent your hair from breaking and repair damaged strands by linking the bonds back together again? Well the Holy Grail has happened. It’s thanks to a treatment called Olaplex and it’s got nothing to do with big hair brands selling you stuff and everything to do with science. The story goes like this; founder Dean Christal, curious to understand how to repair broken hair, teamed up with chemists and was introduced to nationally recognised scientist Dr Craig Hawker. Inspired by the idea, Craig enlisted Dr Eric Pressly and the brains came up with a new molecule that they couldn’t believe the beauty industry hadn’t thought of before. Already a huge hit in America, Olaplex is now taking UK salons by storm and transforming the texture of clients’ coloured hair. The magic works from the inside out to strengthen, condition and literally reconnect the hair strand structure where broken. It’s amazingly simple and it’s how Kim Kardashian’s hair wasn’t totally ruined by ‘platinumgate’. Especially beneficial for chemically coloured hair, it has the potential to restore the health of all damaged hair types given that hair bonds are broken during thermal, mechanical and chemical services. Ask for it (nay, DEMAND it) as an ‘add-on’ service the next time you visit the salon for a cut, colour or even a blow-dry. It pretty much guarantees that your locks will feel softer and look stronger. We are so excited about this product. We couldn’t wait to get it into the salon and start using it on our clients. Anyone who has ever gone blonde knows it’s no easy task. 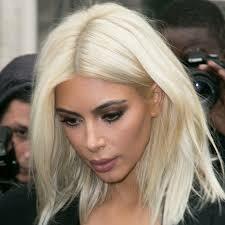 Just ask Kim Kardashian, who had to visit the hairdressers every few days for top ups after she bleached her hair for Paris Fashion Week earlier this year. As well as being high maintenance, another major concern of dyeing your hair is usually the serious damage bleaching can do to hair. This is where Olaplex comes in, the product allows you to change your hair colour without leaving it broken and unhealthy. It’s a single active ingredient (free of silicone and oils) and is designed to be added to to the colour mix during the dyeing process, or used as a hair treatment in itself. 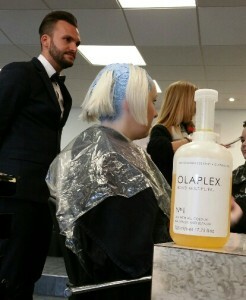 “Olaplex relinks the broken bonds in the hair and repairs hair internally and externally through treatments,” explains acclaimed colourist Tracey Cunningham. 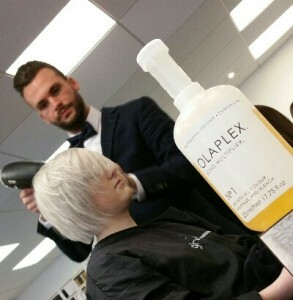 Our Salon Designer Hanah tries out the Olaplex System whilst bleaching her hair. I think Olaplex is a real ‘game changer’. I can’t remember so much fuss being made about a product since the ghd iron was introduced. Olaplex is allowing hairdressers to make cleaner and brighter looking blondes without the the damage, create longer lasting tones and give brunettes all round stronger healthier hair. Because Olaplex multiplies the bonds of hair to strengthen it during colour service it really does make a difference. According to Tracey Cunningham, the benefits go beyond colour, making it great for curly hair that has lost its elasticity or even softening and smoothing the hair of grey hair, which often becomes coarse and wiry. It is an add on service – so yes, in short clients will have to pay more for it. But we hope are clients will notice the difference immediately! For more information speak to one of our team today on 01942671400 or call into the salon on the main shopping street of Bradshawgate, Leigh, Lancashire.